Jumping rope and running are two types of high-impact cardiovascular exercises. More importantly, they burn calories, which in turn reduces fat on the body. This is important to your overall well-being as excess fat leads to high blood pressure, high cholesterol and heart disease. When you are trying to choose between jumping rope or running for fat reduction, it depends on certain variables. To burn fat, you need to burn calories. Based on 60 minutes of exercise, a 155 lb. person burns 744 calories jumping rope and 596 calories running at 5 mph or 744 calories running at 6 mph according to Harvard Health Publications. Although it appears that running is superior to jumping rope, it is misleading. Intensity needs to be taken into consideration. For example, a 180 lb. person burns 980 calories jumping rope at a fast pace for 60 minutes. This same size person burns about 815 calories running at 6 mph for 60 minutes. 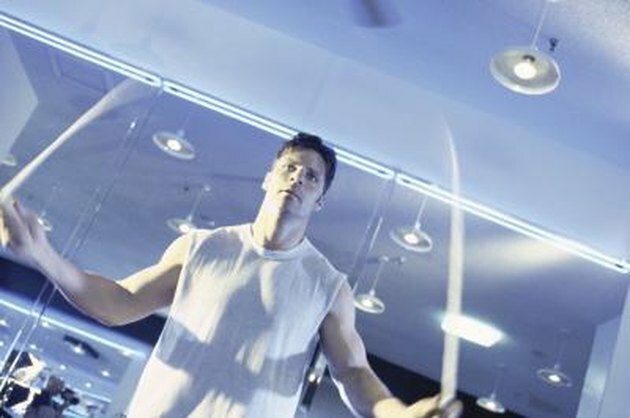 Simply put, if you jump rope at a fast pace, and run at a slow pace, you will burn more fat jumping rope. With both forms of exercise, people who are bigger will burn more calories. When you jump rope, you experience only moderate joint activity. Your wrists and ankles get most of the work, and your elbows and shoulders get a slight bit of involvement. This leads to a small amount of muscle recruitment. The calves get most of the work, and the shoulders get a slight bit of work. Running, however, forces you to work multiple joints throughout your body, such as your ankles, knees, hips, elbows and shoulders. When you use a high amount of joints, you also recruit a high amount of muscle. Even though running is a form of cardio, you still build some muscle because you have to move the weight of your body. When you build muscle, you increase your resting metabolism. A single pound of muscle gained will burn an extra 30 to 50 calories a day, according to the University of Michigan Health System. Running is also more vigorous than jumping rope because you involve so much of your body. Another difference between running and jumping rope takes place in the environment. When you run outside, you are constantly subjected to uneven terrain and hills. This can make you work harder and produce a higher caloric expenditure. Even while running on a treadmill, you can increase the incline, which will increase your intensity. When you jump rope, the only options you have are jumping faster or using a weighted rope. But the fact still remains that you are hopping up and down with a small range of motion. Regardless if you jump rope or run, you need to take a personal interest in your diet. If you eat more calories than you lose through exercise, you will not burn any fat. This is the case no matter what form you choose or how hard you work out. The most important thing is to reduce your calories and follow a healthy diet.